Advanced Tender Search on TradeReader enables you to search Tenders by providing Multiple Search criteria. For advanced search you need to click on following link. You can get Tenders of your choice by providing any one or all the search Parameters. State Search Tenders by States of India. City Search Tenders by City. Due Date >= Last Date of Bid Submission is higher than Date Provided. Due Date <= Last date of Bid Submission is less then or Equal to Date Provided. Tender Value >= Estimated Cost Put to Tenders is Higher or Equal to Value Provided. Tender Value <= Estimated Tender Cost is lesser or Equal to Value Provided. Tender Id Based on TradeReader Tender Reference No i.e TR No. Keyword Searches Tender related to Keyword Provided through Broad Match. 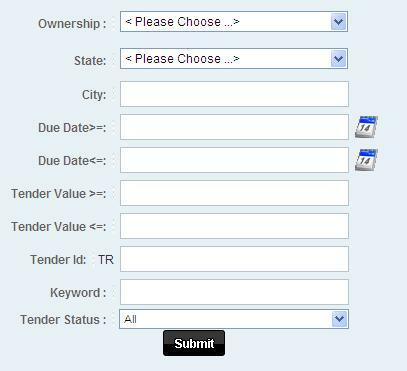 Tender Status All Tenders, Live Tenders – the last date of bid submission is not lapsed. Closed Tenders – Tenders Last date of Bid submission is lapsed.